How has your office copier been holding up lately? Is it still running strong or are you finding that it isn’t able to keep up with your needs anymore? If your machine can’t match your needs it likely isn’t because the machine is going bad, but because your business is going well. What usually happens is that the growth you experience isn’t sustainable with your current machine. If this is the case then it may be time for an upgrade. 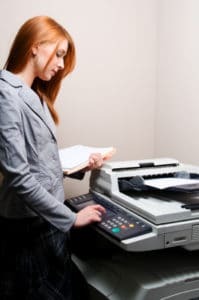 A copier upgrade is a great way to jump-start your business. It gives you the chance to get something new that can handle any of the challenges that you may face down the road. It also gives you the added benefit of being able to find a new leasing company if you don’t like your current situation. The best time to upgrade your copier is near the end of your lease. This way you can do the research that you need, and can plan ahead, especially if you plan to leave your current leading company. It also gives you more ability to leverage in negotiations because you are planning ahead. However, even if you aren’t near the end of your lease it may still be time for an upgrade. Businesses can change a lot in just a few years. Don’t limit yourself to a lesser machine because you are afraid of getting a copier upgrade. Give us a call today at Colorado Springs Copier today if you are interested in getting a copier upgrade. We can help you get exactly what your business needs today and in the future.